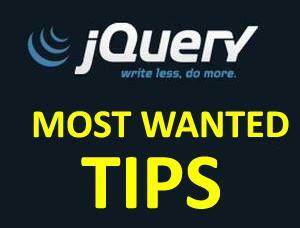 jQuery has already become very popular and it is a must for every web developer. But with it's popularity, it is pretty important for any developer to use it efficiently and intelligently. It is important to know some tips and tricks as they save most important part of any software, that is human effort. In this post, I will be discussing some of the jQuery tips and tricks out of my own collection. Following is my collection of jQuery tips and trick.